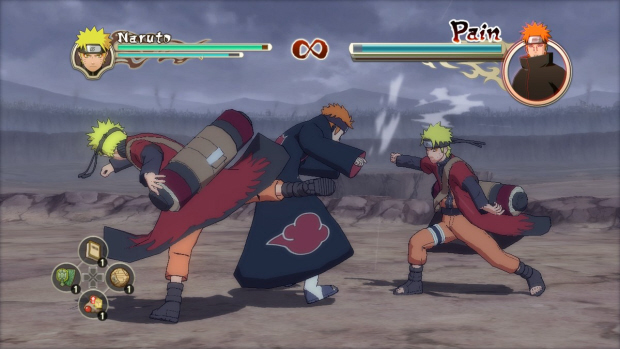 Our Naruto Shippuden Ultimate Ninja Storm 2 guide will help you with the Storm Point Titles that you can unlocking, secret characters, Ninja Cards and other features of this newest entry in the Naruto Shippuden videogame series. Storm Points are accrued throughout your playthrough in Ninja Storm 2, and reaching a certain amount will unlock the following Titles listed. Support Types add additional support stats to your character in the categories of Attack, Defense, Balance, etc. Support Types you can’t unlock in this list are unlocked by playing Friendship Events in the Ultimate Adventure mode. Play as each character 30 times to earn a Title. Earn the Title “Underdog” by losing a battle 10 times. Get the Third Hokage title by viewing 100% of the story views. Also earn titles for collecting all Battle Items, Collectables, Quests, Events and finding a lottery ticket, picking up 30 empty cans and picking up 30 Mushrooms in the Story Mode. You’ll notice there are question marks on the character select screen. You can unlock these characters by gaining Storm Points as mentioned in the list above; you get Storm Points by fighting in lots of battles. You can also gain these characters simply by playing through the story. 1. Pain: Unlock through story mode. 2. Lars: Earn 600,000 SP. 3. Killer Bee: Earn 540,000 SP and Finish 37 Dolls Quest. Next complete “Fragments”. 4. Hokage Naruto: Finish the game, then go to Mount Myoboku. There go up the Stairs to the house and pray at the shrine. This will unlock Hokage Naruto only if you have the “All Ninja Assemble” Achievement/Trophy, meaning you’ll have to unlock all the other characters in the game first. * Note: Look at 2:49 minutes into this video for a full characters overview. Thanks to Kimchen at gamefaqs for the Storm Points Title list.